Seriously; put a knee, or even an elbow, down on the tarmac – the “R” can take it. The factory took steps to shed weight anywhere it could. 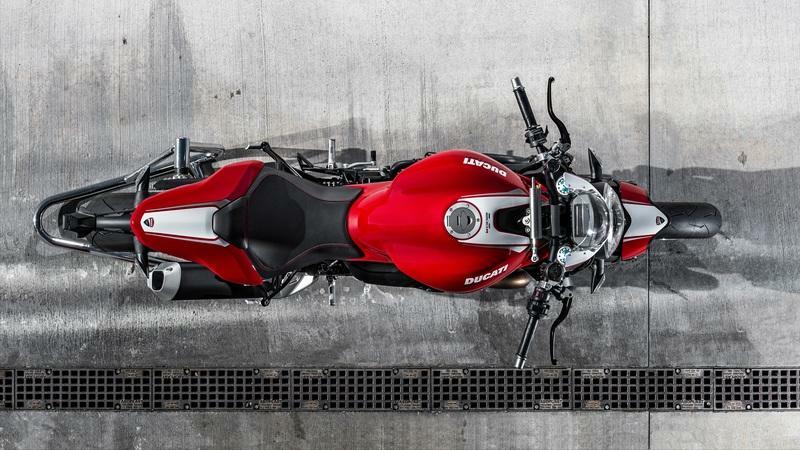 It started with the front fender that carries the same cut-down proportions as the other Monster 1200s, but in lightweight carbon fiber so as to minimize the unsprung weight at the front axle. A cyclops headlight housing dominates the front with a flyscreen that forms a protective pocket for the TFT instrumentation, but little else. The display is configurable, but since it automatically adjusts to changes in the ambient light you won’t have to fiddle with it constantly just to keep it at max visibility. A 4.6-gallon fuel tank gives the flyline that Monster look, kind of all up front with knee pockets that dramatically narrows the tank where it meets the waist. Frame, seat and tank come together in a narrow junction to give your legs a break, and that’s fairly important given the 32.7-inch seat height makes it the tallest Monster currently on offer. An upswept subframe lofts the p-pad area of the newly-narrowed, one-piece seat, and if you’re into a solo/race look, you can conceal the pillion area with a snap-on tail fairing. An aluminum mudguard springs from the subframe just below the underslung taillight, and it mounts the blinkers and tag for easy one-stop removal on race day. 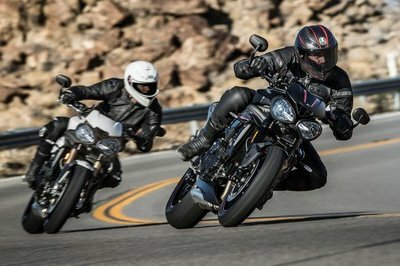 Short-rise bars and forged-aluminum footpegs define an aggressive rider’s triangle, and as for the extra height, that’s there to accommodate the deepest turns. Seriously; put a knee, or even an elbow, down on the tarmac – the “R” can take it. Playing on its eager nature in the corners, ground clearance is increased front and rear to ensure enough space to facilitate the deepest of lean angles if you have the nerve for it. In typical naked fashion, the “R” leaves very little to the imagination with a dearth of body panels, and the tubular-steel Trellis frame itself becomes part of the overall aesthetic. The upper frame section bolts to the engine which then becomes a stressed component and allows a significant chunk of frame to be removed, adding to the overall weight reduction. A 24.3-degree rake angle and 59.4-inch wheelbase gives the Monster its eager nature in the corners with 17-inch, forged-alloy wheels and Pirelli Diablo Supercorsa SP hoops to round out the rolling chassis. Ground clearance is increased by 15 mm front and rear to ensure enough space to facilitate the deepest of lean angles if you have the nerve for it. Öhlins provides for all the suspension needs starting with a steering damper up front to help tame the kickback. A set of inverted, 48 mm forks float the front end on the full trinity of adjustments and 5.1 inches of travel, and out back, a monoshock and progressive linkage deliver the same spectrum of adjustability with 6.2 inches of travel. Wheel travel is on the high end of the spectrum for a street-only bike, but that gives you room when getting aggressive in the corners. As for the hoops, the ZR-rated Pirelli tires come in a 120/70 up front opposite a 200/55, and they rock a bi-compound tread that draws on WSBK-grade tech to deliver stability in all conditions. Bikes with a lot of go require a lot of stop, and the Monster obliges with a pair of 330 mm discs and Brembo M50 anchors to slow the front wheel and a 245 mm disc and another Brembo caliper to slow the rear. Bosch’s 9MP ABS delivers three levels of intervention, plus Off, and it’s bound with the Riding Modes feature for quick adjustments to the ride-quality systems across the board. You can even dial it in to allow a certain amount of rear-wheel liftup if you’re into that sort of shenaniganery. 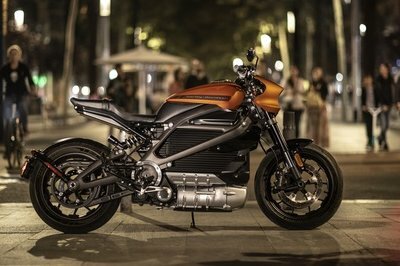 It has more horsepower than the Monster 1200 stablemates and ride modes to tailor that power into three distinct ride personalities. As usual, the electronic delightfulness continues well into the drivetrain. 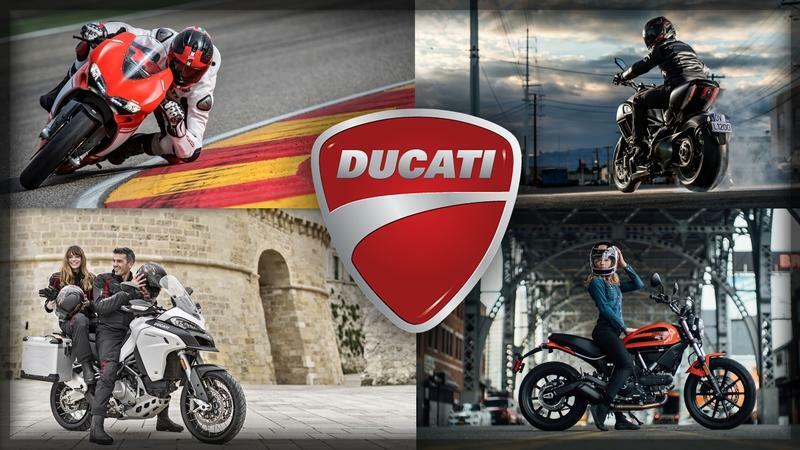 The Ducati Safety Pack bundles the ABS and the traction control together to improve the overall stability of the “R”. Run with the stock presets, dial in your own profiles with a choice of eight possible levels of intervention or turn the thing completely off, it’s up to you. 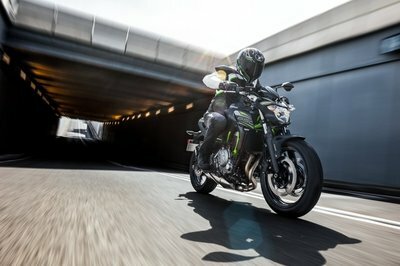 The ride-by-wire throttle control and Riding Modes feature give the engine a trio of personalities: Sport, Touring and Urban. 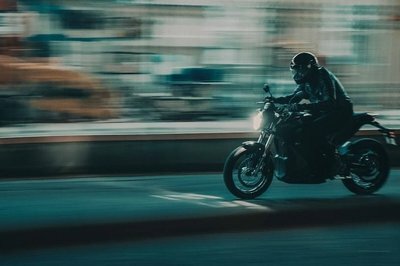 You can expect the full 152 horsepower at 9,250 rpm in the first two modes, but the Urban mode cuts that back to an even 100 ponies, ’cause you don’t really need more than that around town, right y’all? Torque maxes out at 7,750 rpm with 92 pound-feet of grunt, 69 of which are available as low as 3,500 rpm for plenty of giddy-up in the low range, and top speed is approximately 165 mph. 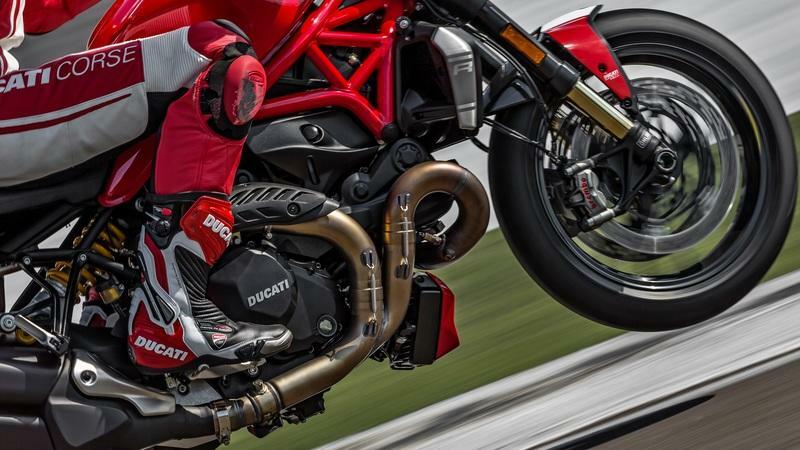 Power comes from a Testastretta plant rocking Ducati’s signature Desmodromic valvetrain that eliminates the valve springs – and their associated harmonic float – in favor of a pull-closed cam to help time the four-valve, dual-spark heads. As for the 11-degree component of the name, this comes from the degrees of rotation where valve overlap takes place, and it speaks to an effort to keep emissions low and the free hydrocarbons contained. The 90-degree L-Twin plant packs a 106 mm bore and 67.9 mm stroke for a total displacement of 1,198.4 cc, and the compression ratio was boosted from 12.5-to-1 to 13-to-1 by subbing in a thinner head gasket. Clever, right? That’s where the extra horsepower came from over the other Monster 1200s. Induction control falls to a new pair of oval throttle bodies that have a 56 mm equivalent diameter, up from 53 mm. The exhaust system also was resized 8 mm larger up to 58 mm, so both ends of the circuit were opened up some to let the engine breathe. A slipper-type clutch couples engine power to the six-speed transmission and provides another layer of protection for your rear contact patch. 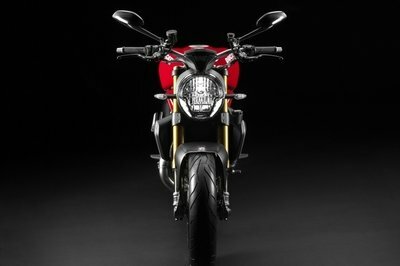 The Monster 1200 R is a top-tier machine, no doubt about it, but the factory managed to keep the sticker just below the $20k mark. 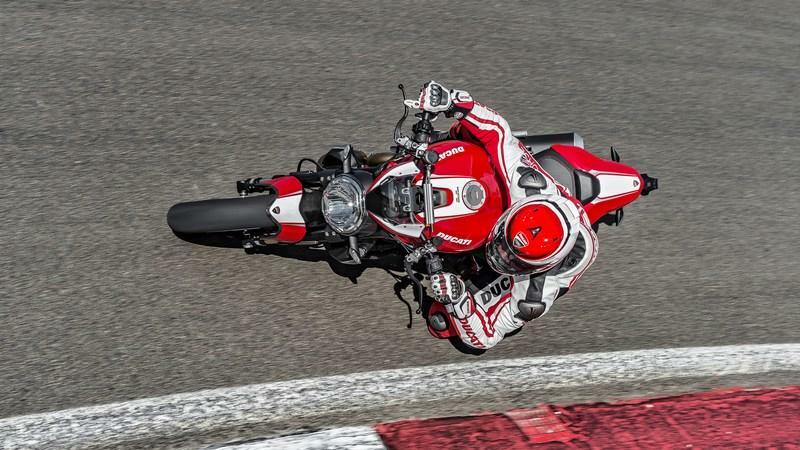 The Monster 1200 R is a top-tier machine, no doubt about it, but the factory managed to keep the sticker just below the $20k mark at $19,395. 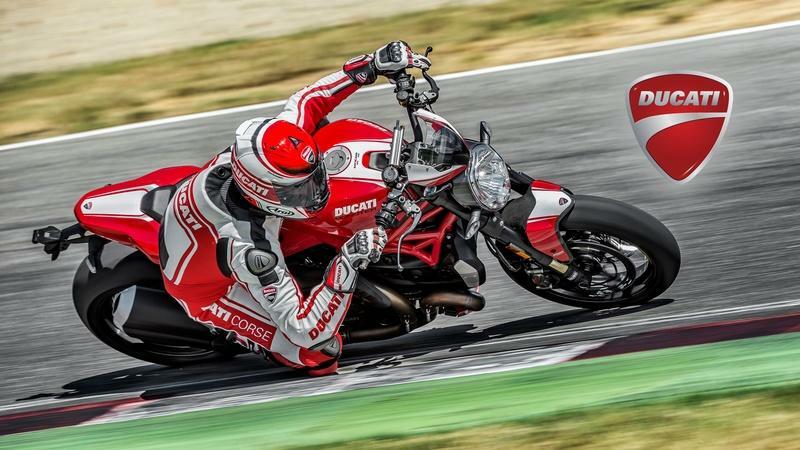 Oh, and it looks like you can get one in any color you want, as long as you want Ducati Red with white livery. Aprilia brings the hurt with more horsepower and torque and still manages to score a minor victory at the checkout counter. As competition for this Italian stallion, I wanted another Eye-Tie, and I didn’t have to look far; behold, the RSV4 RR from Aprilia. Okay, sure, it isn’t nearly as naked, but most street-legal racebikes fall more toward the superbike end of the spectrum with a skosh more in the way of body panels. The front blinkers are married to the mirrors, and the rear turn signals and plateholder are also combined with the mudguard to make it easy to shed the weight of all of the above for track days. Clip-ons pull the rider into the jockey position, and the rider’s footpegs are definitely positioned to keep your feet clear of the tarmac in the deepest of turns to give the RSV4 the same kind of capability that the Monster brings to the table. Sachs suspension components float the Aprilia with the full trinity of adjustments front and rear, so neither really gain anything in the stems since they’re both pulling from the top shelf. Brembo and Bosch made out like bandits as well since both bikes carry those brands in its brakes and ABS slots, respectively. 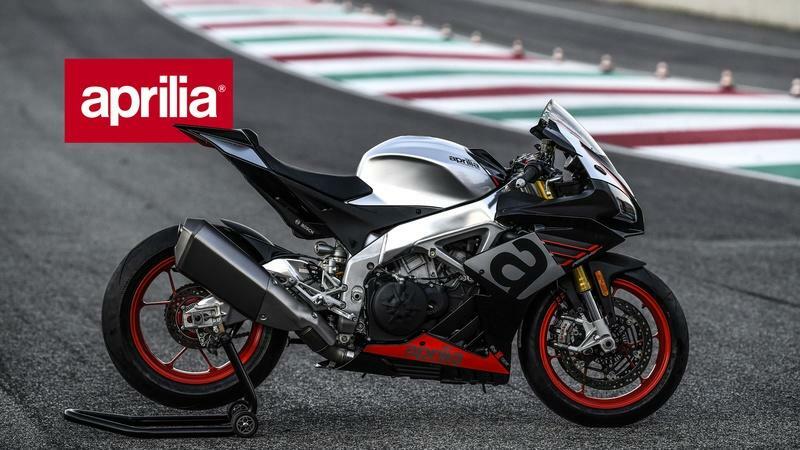 Aprilia brings the hurt with a V-4 engine that, while it only displaces 999.6 cc, manages to punch above its weight with a whopping, 201 max horsepower and 84.8 pound-feet of torque against 152/92 from the L-Twin. The RSV4 also holds station with Ducati in the engine-control systems with a full selection of ride-quality tweaks on board. 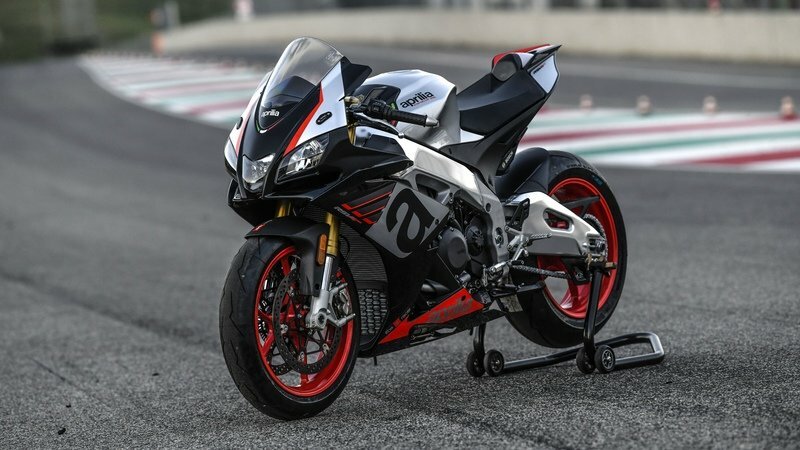 Aprilia also scores another minor victory at the checkout counter with its $17,499 sticker, though at that price point, another couple grand isn’t a big deal. See our review of the Aprilia RSV4 RR. 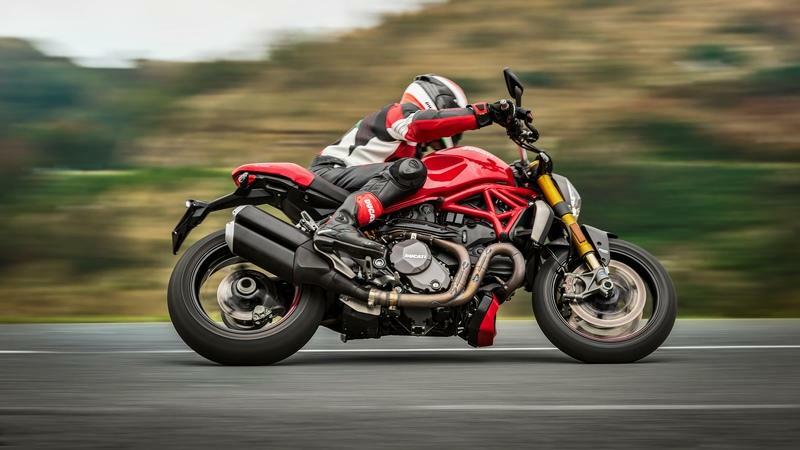 See our review of the Ducati Monster 1200 / 1200 S.